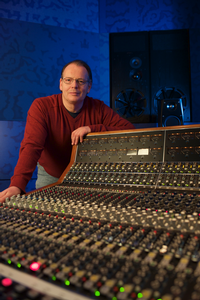 Over the past 30 years, Ronald Prent, who began his career as an inexperienced assistant engineer at Wisseloord Studios in The Netherlands, has established himself as one of the most accomplished and innovative mix engineers in the world. He specializes in the area of surround sound, not only pioneering in the field of mixing, but also playing a key role in the conceptualization and development of new technology needed to meet the demands of working in 5.1 and other progressive high-resolution multi-channel formats. In 1999, after many years of traveling the world as a freelance engineer and working on a long list of impressive live and studio recordings, Ronald settled himself and his extensive collection of gear into Galaxy Studios, Belgium. The studio shared his enthusiasm for cutting edge surround sound and Ronald became a “test pilot” for Sony and Philips’ DSD/SACD format. Many of the projects that he mixed in the early days for this format are still held up as benchmark examples of creative, cutting edge surround mixing – e.g., Guano Apes – “Don’t Give Me Names”, Kane – “So Glad You Made It”, Herbert Grönemeyer – “Mensch”. When Galaxy made the decision to add a world-class mastering room to their facility, Ronald contacted SPL with his design concept for a state-of-the-art surround-capable mastering console. To meet his exacting technical specifications, SPL employed the 120 volt technology of their new Supra op-amp, developed by Wolfgang Neumann, which was also later used in their PQ-2025 5-band equalizer. The remarkable MMC1 console boasts a 150dB dynamic range and 200kHz bandwidth along with 170 channels of internal switching. Due to the sensible and functional layout created by Ronald, this console is now a part of SPL’s regular product line and is used by some of the top mastering engineers in the world, including Bob Ludwig at Gateway Mastering, Portland, Maine, and Simon Heyworth at Super Audio Mastering in Devon, England. After many years of using API equipment for mixing and recording in stereo and frustrated by the lack of options for analog compression for his surround work, Ronald collaborated with then-API-designer Paul Wolff (now of Tonelux) to create a multichannel version of their renowned 2500 compressor. The re-designed version allows fully independent control over vertical and horizontal linking between channels and independent threshold control thus giving unprecedented control in surround compression. The collaboration between Ronald and Paul/API was so successful, they went further into the realm of analog surround, developing the still cutting-edge API Vision, a large-format fully analogue console. Thanks to Ronald’s detailed ideas for buss structure, panning and workflow, this ground-breaking console allows users to mix discrete surround and stereo streams simultaneously without compromising the quality of either. This efficient method of working has allowed many clients the luxury of mixing surround content that otherwise would never have been possible within limited budgets, and at the highest possible quality. Beginning with his impressive demonstrations on behalf of Sony/Philips SACD in 2003, Ronald has been asked on numerous occasions to guest-lecture and give master classes on the subject of recording and mixing for universities around the world, including McGill, New York University, Middle Tennessee State University, and Banff Centre for the Arts. Ronald has also participated in and/or hosted many workshops and panel discussions at AES conventions in the U.S. and Europe. His demonstrations of surround mixing, along with respected colleagues such as Frank Filipetti, Geroge Massenburg, Elliot Scheiner, Morten Lindberg, Ulrike Schwarz, and Akira Fukada, have never failed to draw an interested crowd of students and established professionals alike. PMC Loudspeakers have long used material from Ronald’s discography to demonstrate the full-range integrity of their products, resulting in recent years in the informal but well-attended (jam-packed!) “PMC Listening Sessions” at AES conferences. In 2010, an astounding opportunity opened up, allowing Ronald to “go back to his roots” to revive and reopen Wisseloord Studios. Spearheaded by Ronald in conjunction with four business partners, the newly revamped Wisseloord officially opened its doors in March 2012. Working with acoustic designer Jochen Veith of JV Acoustics in Munich, Ronald has revitalized the world-famous studio, which had fallen into a serious state of disrepair. The musical soul of the place has been kept in tact, but much-needed and extensive redesign has been done to the facility, updating equipment to the highest technical standards and building a diverse team-focused business plan intended to provide clients with an unparalleled level of service in a comfortable creative environment. The unique underlying concept allows for expansion into developing formats as well as tried-and-true “old school” techniques. Investment and support for such a groundbreaking facility was only possible due to Ronald’s outstanding reputation in the industry and his proven track record for excellence in the field of audio. Ronald’s latest exploits once again include pushing beyond today’s standards and developing formats for the future. Ronald is one of the first engineers in the world to mix pop/rock releases in 9.1 surround, including albums for Mando Diao, Tiesto, Ozark Henry, plus a children’s musical for German rock legend Peter Maffay currently showing in planetariums around Germany. Ronald’s long list of clients includes such notable artists as Simple Minds, Rammstein, The Scorpions, Mink DeVille, Richie Hawtin, Udo Lindenberg, Gotthard, Tina Turner, André Rieu. Def Leppard, Freddie Mercury, and Herbert Grönemeyer. Recent mixing projects include albums/multi-media productions for Live, Within Temptation, Clouseau, Manowar, Alain Clark, Peter Maffay, Lori Lieberman, Ozark Henry, Hooverphonic, David Garrett, and The Common Linnets.